As a result, the stadium was closed, with disruption to local sporting and social events due to take place at the venue. The club confirmed that additional work on the floodlights is taking place and it is hoped that the ground will reopen soon, however to date the stadium is still closed, more than 6 weeks after the incident. Resulting in their first fixture of 2019 being relocated to a neighbouring stadium. With circumstances like this increasingly likely with aging infrastructure and severe winter weather, it begs the question, would your organisation be ready to react to such an occurrence and would you have the correct procedures in place? Critically, in this instance no-one was hurt and everyone was evacuated safely however, if this had been your stadium or similarly vulnerable structure, would you have the capabilities in place should the pylon have collapsed during one of your home matches? Noticomm® allows the right people to communicate with one another during emergency response. In this circumstance, Noticomm® would have allowed management to instantly contact responders, stakeholders and interested parties with permission-based information relevant to ‘what they needed to know’, saving time at the notification and mobilisation stage, subsequently relieving pressure and improving the response from the very start. A frequent issue with emergency response can be a lack of clear, real-time information for responders so that the full scope of the situation is understood. The Noticomm® system and app is universally accessible and as such checklists, plans, contact lists, situational reports and photos of the scene can be shared in real-time to ensure an accurate and efficient response. Should the pylon have fallen on Hull KR’s or neighbouring property, the responders could have been informed of this immediately and responded accordingly. You can get the right people the right information quickly – but if you send them to the wrong place, they won’t arrive at the right time. Noticomm® uses Google Map integration to provide respondents with precise directions to ensure optimal response. So, should the pylon have landed on club property, using Noticomm®, responders would know precisely which access points to use, being updated with real-time information and the On-Scene Commander would be updated with estimates of the responders’ arrival time. Noticomm has already been used by several Inverroy clients, such as Maersk Oil, to facilitate emergency response, click here to find out more. 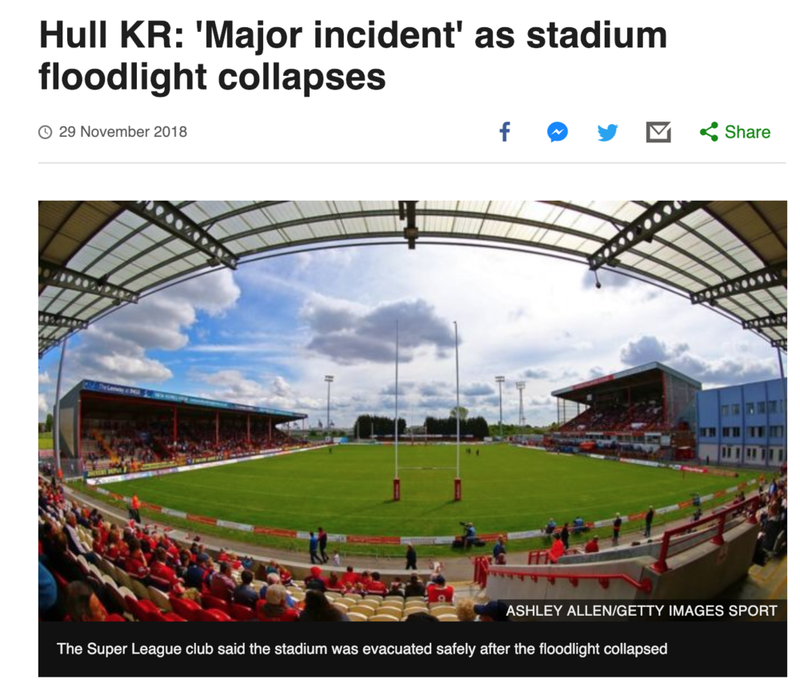 Fortunately, no-one was hurt at Hull Kingston Rovers’ stadium, however it is crucial to have response procedures such as Noticomm® in place should the worst happen so that you can be ready to respond and recover.